The League of Extraordinary Gentleman said that unless I talk about something other than Rugby League that I would have to rename TGOS, The Game of Rugby League. I’m taking the League’s advice and branching out again, mainly because I don’t want to pay for another domain name. Now that Jarryd Hayne’s first season in the NFL has finished and Ben Simmons’ first (and likely only) season for LSU is really entering the meaty bit of the schedule, I thought it might be fun to compare the two, not in terms of athletic ability or even in terms of talent (both are incredibly athletic and talented) but in terms of a comparison of hype, especially in respect of the difference between the U.S and Australia. Jarryd Hayne, underhyped or overhyped? Hayne probably ended up somewhere between Training Camp Oddity and Tim Tebow 2.0 after Season 1 and the media interest depended on whether you were from Australia or the U.S. It makes an interesting comparison in perspective though. In Australia, we found out (inter alia) whether Jarryd had found good coffee in San Fran, a day by day breakdown of how many training squad reps he was getting in the pre-season, how good he was at Table Tennis and a plethora of other stories. Often the Australian media compiled a summary or omnibus of any mention Hayne received from the U.S media (which I ironically had almost always already read). There was no limit to what the press would write about. It wasn’t on the Kim Kardashian level but it was about as far as Australia could go along that road. He dropped a lucrative career in Rugby League to swim in a much larger pond in the NFL. Apart from punters and kickers, only Colin Scotts had tried to make the leap and actually succeeded (I’m going to invoke a heavy Jesse Williams caveat here – Williams was/is potentially the best player Australia has in the NFL with his career for the Crimson Tide hopefully a portent of things to come, once he shakes his terrible run with injuries/illness). Jarryd Hayne’s move to the NFL from the NRL is a massive, massive story… for Australia. As big as when Karmichael Hunt left the NRL to play AFL. It broke the internet basically. Most people didn’t think Hayne would even get on the field, let alone make an active roster, so suiting up for 4 pre-season games and 8 regular season games exceeded expectations on many levels. But his pre-season performance set up unreal expectations for the rest of the season. The fact that he seems to be coming back for a second season means that he has at least set a great foundation for success next year (and showed he is giving this a red hot go). Awesome pre-season (which gave him his shot) but ordinary regular season. Probably the last stat was the killer. 3 fumbles. If he catches all of those, he probably buys himself time on the active roster for the whole season, giving himself a chance to bust a couple of big returns and some extra carries as a running back after all those injuries for the 49ers. Verdict – Properly hyped if you were a NRL fan or a NFL fan living in Australia. Otherwise Overhyped. Jarryd Hayne was a very interesting story in the U.S…in the pre-season. Australian Rugby League player making it big in the States was big news. Priceless advertising during the pre-season for the NRL, however, after Hayne dropped that first punt the story immediately died. That is not to say that the Australian media didn’t keep following the story. U.S media (with the exception of Cam Inman who ran with the story all year) seemed to vacillate between mildly disinterested to outright annoyed, in the case of Lowell Cohn from the Press Democrat who had clearly had enough by the end of the first regular season game. The 49ers were an ordinary side which didn’t help matters and their head coach was under pressure from the very beginning of the season. Jarryd Hayne ended up being an unnecessary sideshow for the U.S media. I can’t blame them. Jarryd Hayne might have serious potential but during the regular season he was rarely sighted. Even Australian fans got tired of waking up at 3 in the morning to see Hayne touch the ball 2 or 3 times (if at all). Verdict – Properly hyped and then an annoying sub-plot to the 49ers moribund season. Let’s not beat around the bush with Simmons. He is a flat out star. Son to American ex-NBL player Dave Simmons (I am old enough to remember him running around with the Melbourne Tigers – I’m officially old now) and Australian mother Julie, Ben grew up in Australia including stops at Newcastle and Melbourne, playing both Rugby League and Australian Rules Football as well as Basketball. In 2013, he moved to Florida in the United States to play high school Basketball for Montverde Academy where he won 3 straight National High School Championships garnering innumerable personal accolades along the way, including the Naismith National Boys Player of the Year and Gatorade National Basketball Player of the Year. His Final season stats for Montverde were an average of 28 points, 11.9 rebounds and 4 assists a game. Many expected him to go to one of the top college programs like Duke, North Carolina or Kansas but he went to LSU where his godfather David Patrick is the associate head coach. Will probably be a one-and-done man when it comes to college, Simmons is widely touted as a future number 1 draft choice in the NBA and is currently starring for LSU (11-7 and SEC 4-2) where he is averaging 19.4 points, 12.8 rebounds and 5.1 assists per game. Let’s compare the hype. I’ll have to go in reverse skating direction this time because Australian interest obviously trails the U.S interest. First a comment on American coverage of Basketball. This will tell you everything you need to know. There are at least 4 recruiting services which regularly rank high school Basketball players in the country and provide a running commentary on which colleges kids are potentially in the process of committing to. These services cover each of the high school grades. Most of the information is only obtainable by subscription. People actually pay to know this stuff. All the major sports are covered in excruciating detail. Australians you can get up off the floor now. The AAU (Amateur Athletic Union) adds a layer of complexity not easily understood in Australia. The AAU runs a series of summer tournaments and pretty much every high school kid serious about Basketball plays on a team each season. It is heavily followed as a predictor of success (along with high school play). The Australian equivalent is club sports which is low key compared to AAU. To say that Ben Simmons is venerated is an understatement. More ink and kilobytes have been committed to Ben Simmons than any other freshman this season. When they talk about other prospects it is as a comparison to Simmons. All the major sports networks cover his exploits and analyse his game. Verdict – Properly hyped. He is the real deal. Put it this way, Bill Simmons started calling him his illegitimate son at least 2 years ago. It’s trite to say that Ben Simmons arrived on the American radar before the Australian one. In Australia, even as an avid Basketball fan, Simmons only arrived in the collective consciousness about a year or two ago. By then even non-Basketball Americans knew who he was. Australians only knew about Simmons because the Americans were getting so excited. It is a common theme with overseas based Australians. Andrew Bogut received and receives at least 9 to 10 times more coverage in the U.S than in Australia. Andrew Bogut would literally only make the news in Australia during the NBA playoffs. Ditto Matthew Dellavedova. Ditto Patty Mills. Ben Simmons is no different. Seeing Jarryd Hayne cross over has brought it home for me again. If an Australian makes it big overseas then Australians have a hard time trying to keep up with it unless they were big in Australia first. 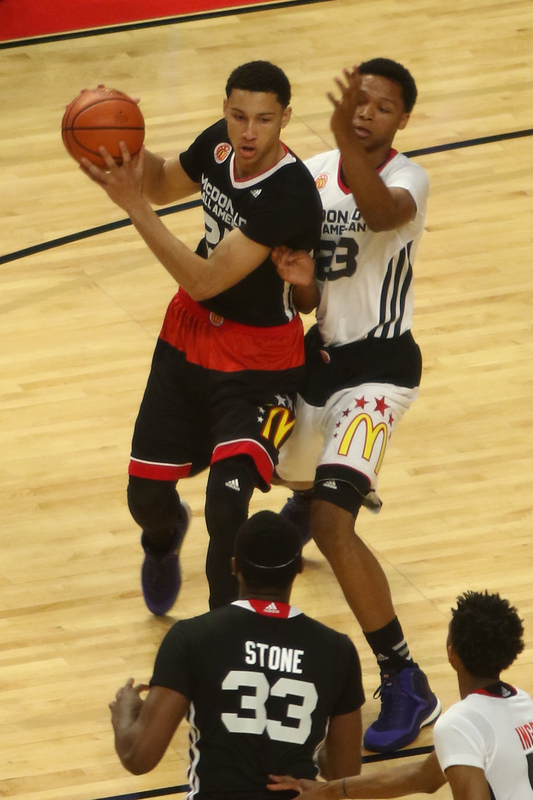 Verdict – Ben Simmons is seriously underhyped at home. Jarryd Hayne is still on the radar and could still earn himself a long fruitful career in the NFL but the odds are still stacked against him. Next season he will be more experienced but much will depend on the roster he finds himself on and whether there are any opportunities for him. From a fan’s perspective if he gets a serious shot he will show what he can do. I’m hoping he gets another shot. If he does then there is a real chance he will be properly hyped in Australia and the U.S.
Ben Simmons will be a superstar, however, he will always be bigger in the U.S. That’s not to say that Australians won’t love him but he will always get better coverage in the U.S. The Golden State Warriors. Every time you think they’ve fallen back to earth they put in performances like those against the Cavs and the Bulls. Back to back beat downs. Can’t wait to see them play the Spurs. Match fixing. Et tu Tennis. This entry was tagged American Football, Andrew Bogut, Australia, Basketball, Ben Simmons, England, EPL, Football, Jarryd Hayne, NBA, NFL, NRL, Rugby League, Soccer, United States. Bookmark the permalink.